An assault victim was also directed to an “unmanned” police station in another gaffe, according to documents released through Freedom of Information. Police Scotland dealt with almost 200 “notable incidents” where concerns are flagged up about the way emergency calls have been dealt with by the force – during a period when it dealt with more than three million calls. Scottish Conservative justice spokesman Liam Kerr said incidents of “human error” were inevitable in an organisation the size of Police Scotland. But he added: “This research sets out scores of cases which, frankly, should never have happened. Of these, 62 involved officers going to the wrong address and 81 led to a delay in police attendance. Among the most serious matters were not responding to a warning about a missing person who was later found dead, and a member of the public threatening self-harm being treated as a “false call”. Other issues recorded were an assault victim being told to go to an unmanned station to report the incident and officers failing to attend a domestic abuse call. During the 18 months, Police Scotland dealt with 3,425,123 emergency and non-emergency calls, with noticeable incidents raised equating to fewer than 0.006 per cent of calls. 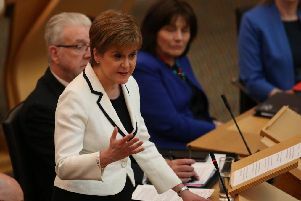 The issue of control blunders was raised at First Ministers’ Questions two years ago by Tory leader Ruth Davidson after the case of Elizabeth Bowe whose 999 appeal for help was not acted on by control room staff at Police Scotland. She was later killed by her brother. The Bilston Glen centre was criticised following the deaths of John Yuill and Lamara Bell in July 2015. The couple lay undiscovered for days after a crash on the M9 near Stirling despite a sighting of their wrecked car being reported to the control room.